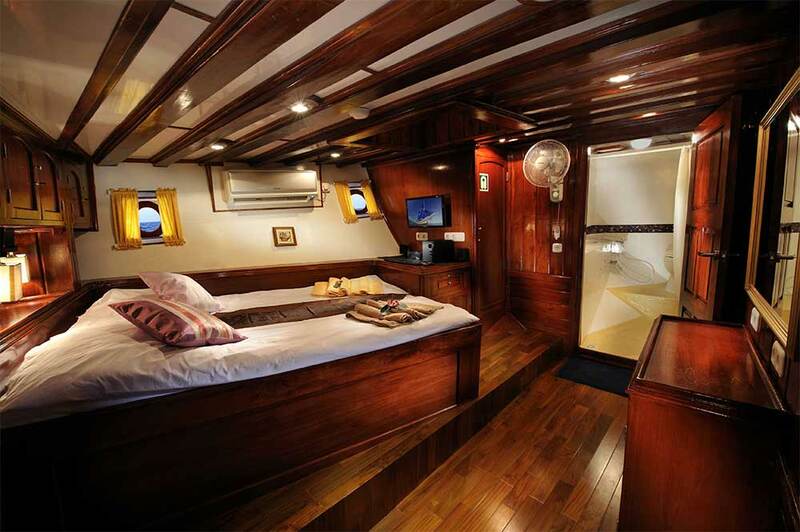 S/Y Indo Siren is more than just a Phinisi diving yacht, and it’s more than a luxury boat, too. 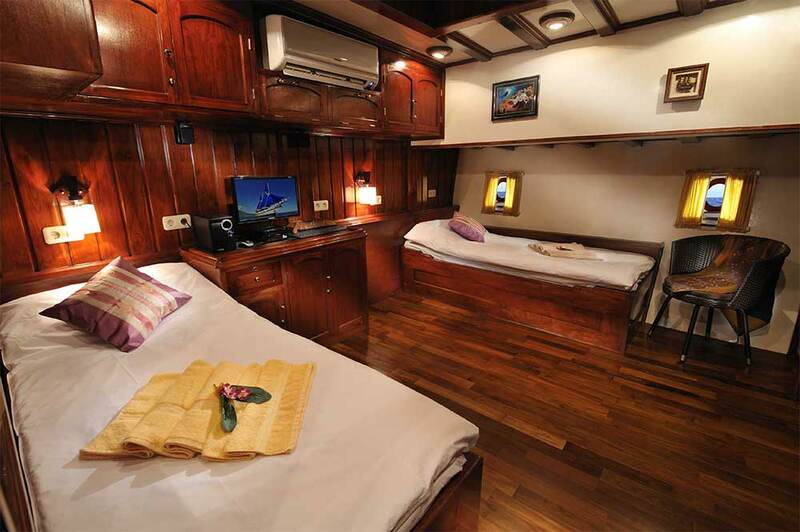 Everything from its conception to its onboard facilities is perfect for discerning guests who want to enjoy liveaboard diving trips in Indonesia. Purpose-built and new in 2011, the boat was designed by divers, for divers. 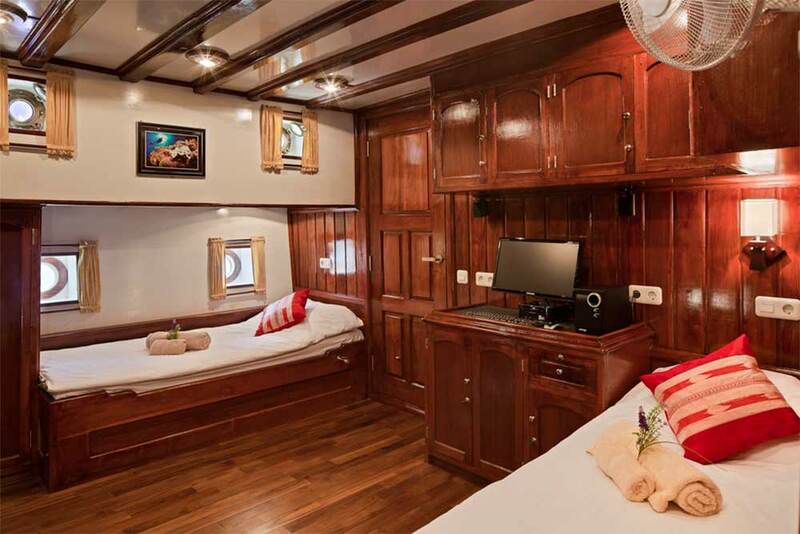 It has size and modern technology to ensure that the cruises are safe and comfortable in all sea conditions, but it still has lots of classic charm, made from Ironwood and furnished in teak. Divers can enjoy the special feeling that only classic styling can give, but still have creature comforts, and modern luxuries when on board. 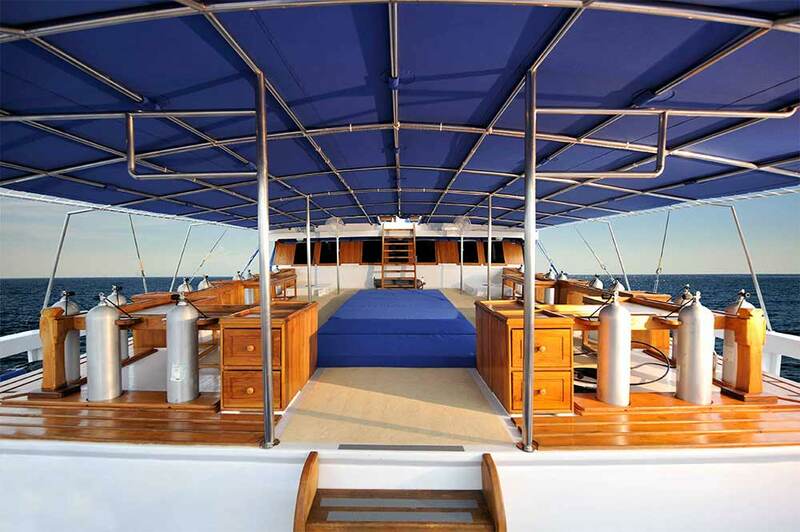 Up to 16 lucky guests enjoy cruises of one week to up to a fortnight. 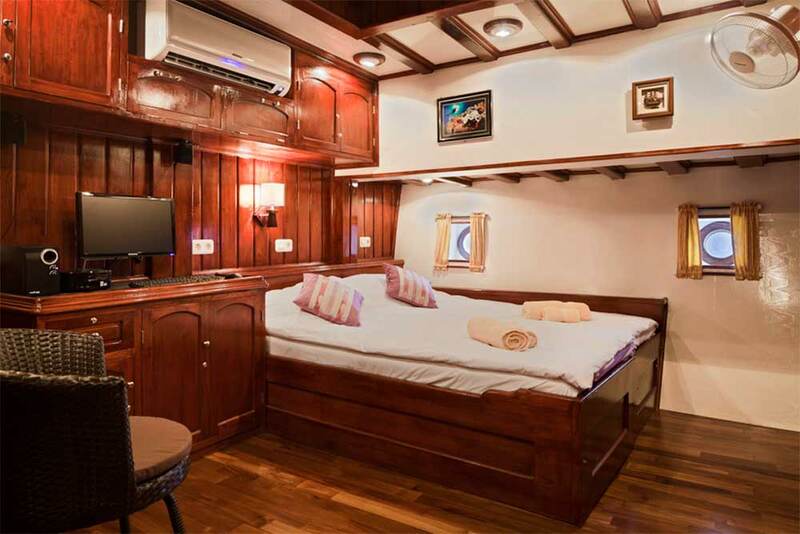 The twin and double cabins are independently air conditioned, have en suite bathrooms with hot & cold fresh-water showers and audio/video entertainment. 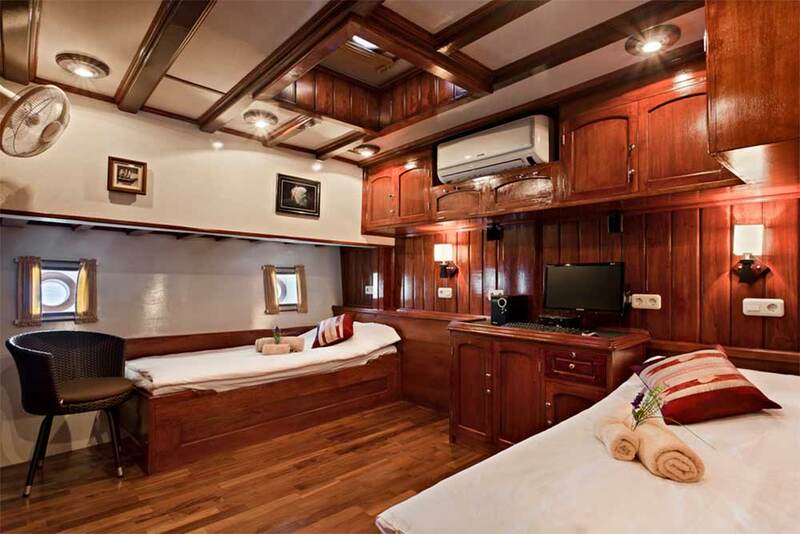 The large cabins have space and storage areas for the guests to truly feel at home throughout the cruise, along with fresh towels, bathrobes, a hairdryer and security box. The communal areas include an air-conditioned lounge, huge covered outdoor dining area, a large and well-designed dive deck that has warm-water showers. Underwater photography is becoming more and more popular, and often more than half of the guests bring cameras and more. Indo Siren has designated outdoor and indoor camera workstations, with charging facilities, personal rinse tanks, and more. In the lounge there are large sofas and armchairs, a large flat-screen television with an extensive movie library and even a cocktail bar. There are complimentary kayaks for guests, and massage & laundry services. The two motorized dinghies are used for diving, and to transfer guests for land and beach excursions. 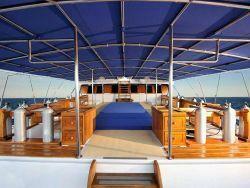 For divers on S/Y Indo Siren, the competitive rates include free use of diving equipment and free Nitrox. Those who don’t have Nitrox certification can easily take the course on board with one of the professional instructors on every cruise. Open Water divers can also take the Advanced Course. 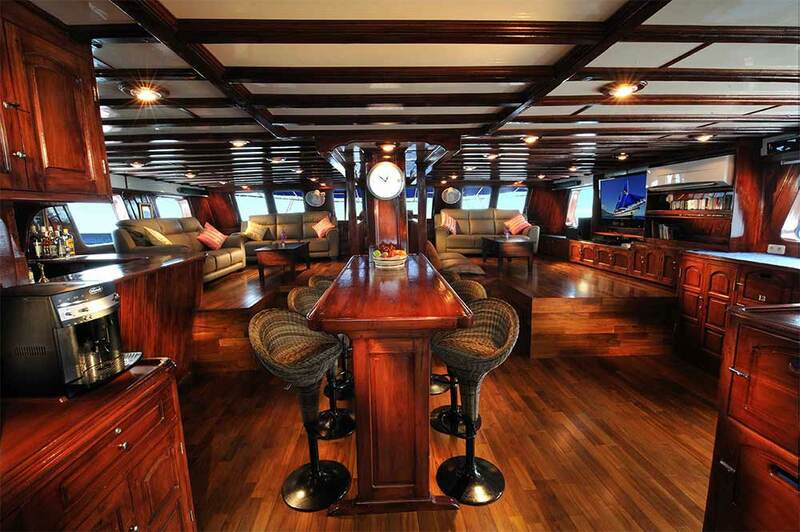 It total, there are 8 private cabins on this 40m yacht, and the (12) crew & diving staff take the best and most-professional care of the guests throughout the diving cruises. Delicious food is served, that is a wonoderful mixture of local and western cuisine. Also, local beer and soft drinks are for free. The whole experience is enjoyable, from start to finish, and both above and below the surface. Although the yacht is very luxurious and easy to relax on, there’s plenty of other things to do during the trips, including kayaking, beach excursions and snorkeling in crystal-clear water at healthy, colourful reefs. 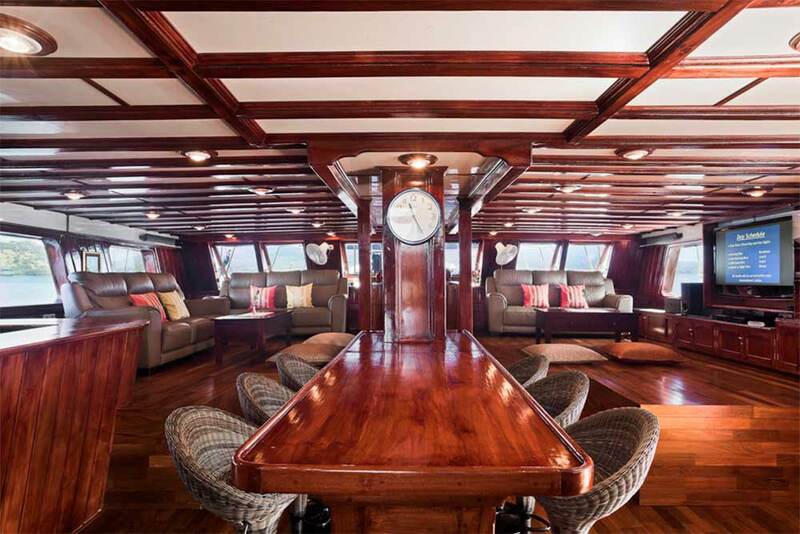 M/Y Indo Siren has three main itineraries. From May to October, the trips are around Komodo, and from November to May at Raja Ampat. This is to always be in 'high season' to enjoy the best weather and diving conditions. 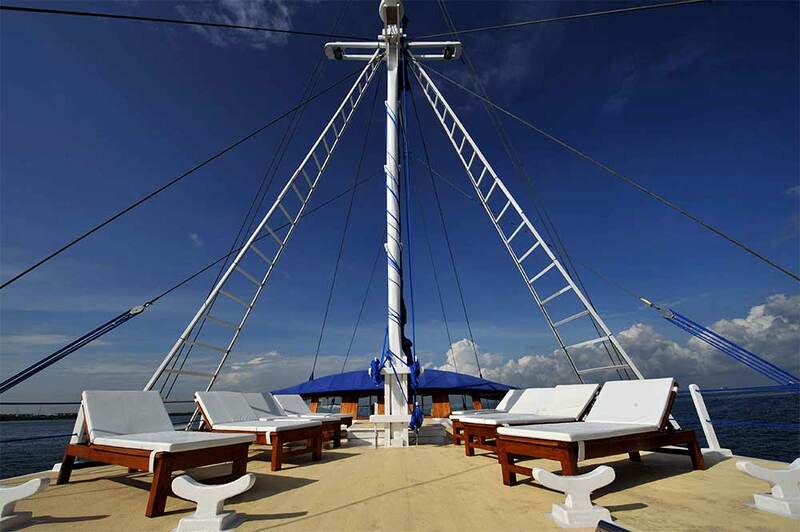 The other itinerary is a 'crossing trip,' which is from Komodo to Raja Ampat or vice versa. 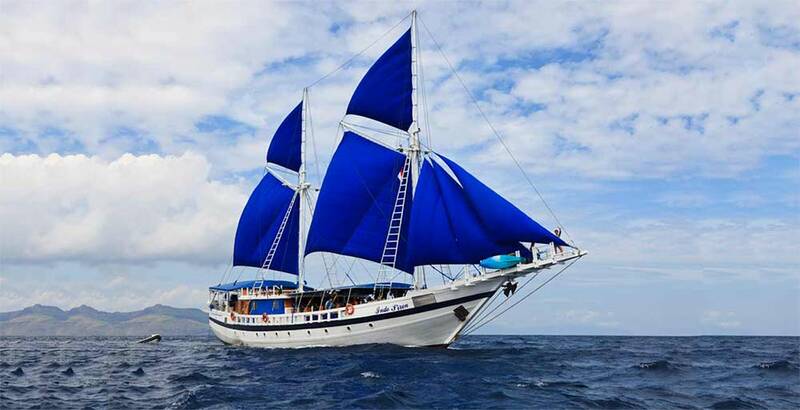 These crossing trips explore the less-discovered reefs of the Banda Sea. 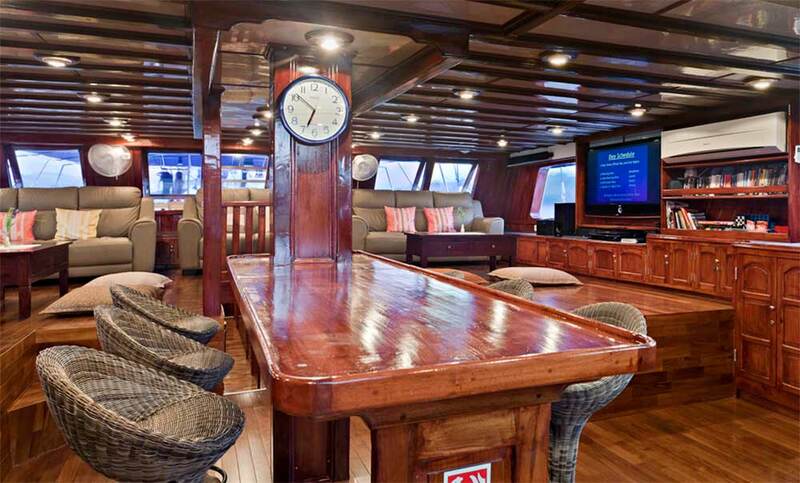 Before every dive on M/Y Indo Siren, guests will be given a comprehensive dive briefing. It is both polite and necessary to pay attention, as doing so will greatly improve your experience once underwater. Being out at sea for a week or more is the perfect opportunity to increase your diving certification level and gain experience. Open Water Diver guests on Indo Siren can upgrade to the Advanced course, and anyone not EAN certified can take that course, too. Nitrox fills are free on Indo Siren for certified divers. Please let us know in advance if you're interested in taking either course on Indo Siren. Free scheduled transfers are available from local airports and/or hotels & resorts on the day of departure and return. Please contact us for details. Booking domestic flights within Indonesia online is not easy when using a credit card from overseas. However, to ensure that you do not miss your vital connections, we strongly advise guests to book the cruise first, then ask our advice on how best to reach the pick up point or local airport. This also applies to flying away after the trip. Contacting us can save time, money & inconvenience. A full standard set of diving equipment with SMB (safety sausage). Free Nitrox fills for certified divers. 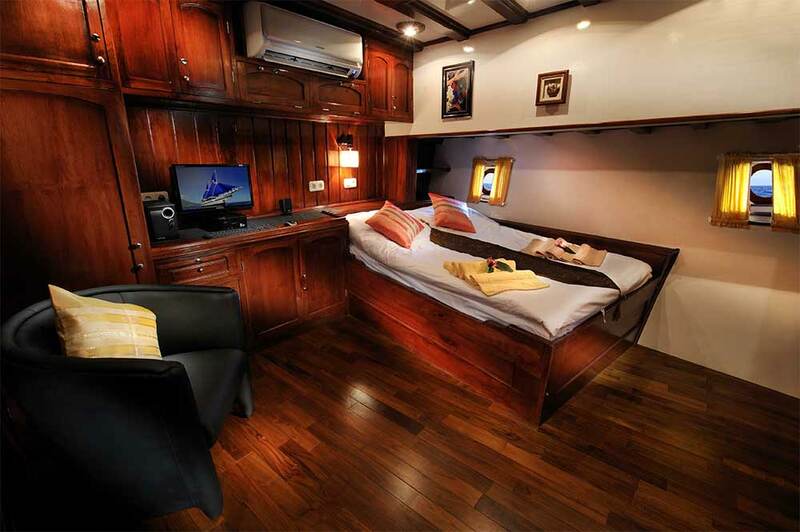 Full-board accommodation: All meals, snacks and drinks, including coffee, tea, herbal tea, soft drinks, local beer, fruit juice. Local transfers on departure and return days. Indo Siren guests are encouraged to have comprehensive diving insurance cover. The team has the best medical support and facilities, plus the ability to quickly evacuate anyone in an emergency, even when located in the most remote areas of Indonesia.